A comfortable, grown-up hotel where dogs and their traveling companions are not made to feel like pariahs, relegated to the smelly room next to the laundry. Lots of outdoors to run around in; fields, forests, or sandy beaches will do – we’re not fussy. A few dog-friendly coffee shops or pubs don’t hurt either. 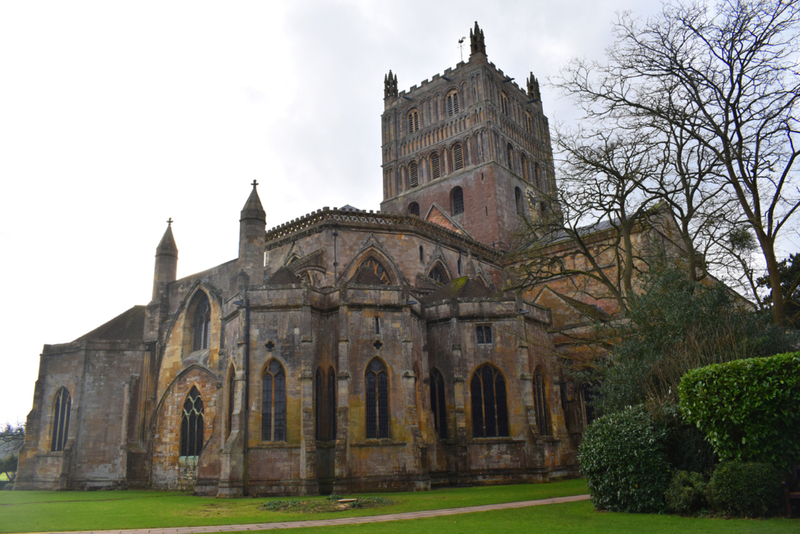 Last month Lulu the Westie and I, along with her Westie pal Darcy and his human chums, discovered Tewkesbury, a medieval market town at the confluence of the Rivers Severn and Avon. 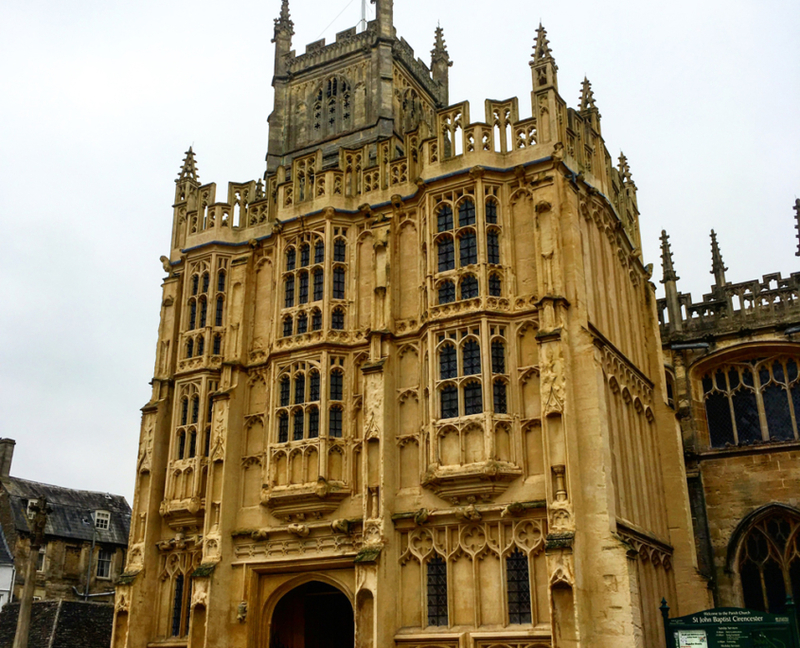 Just two and a half hours northwest of London, the Gloucestershire town beneath the Malvern Hills sits on the Northern edge of the Cotswolds. It has, we discovered, everything needed for a dog-friendly break and then some. Tewkesbury Park , was named”Fido’s Favorite – Best Pet Friendly Hotel” in the 2017/18 bestlovedhotels awards. What better recommendation for a Westie outing? We went (at the invitation of the owners) to check it out. The family-owned hotel in a converted 18th and 19th century manor house has been undergoing a dramatic programme of refurbishment. 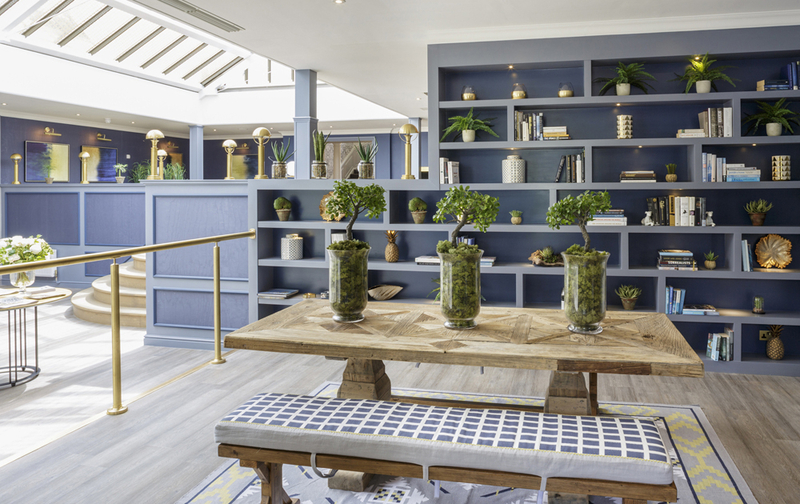 In late 2017 a series of glamorous “heritage suites” (lovely but not dog-friendly) and a wing of ground floor, dog-friendly rooms were launched. One of several cocktail bars. 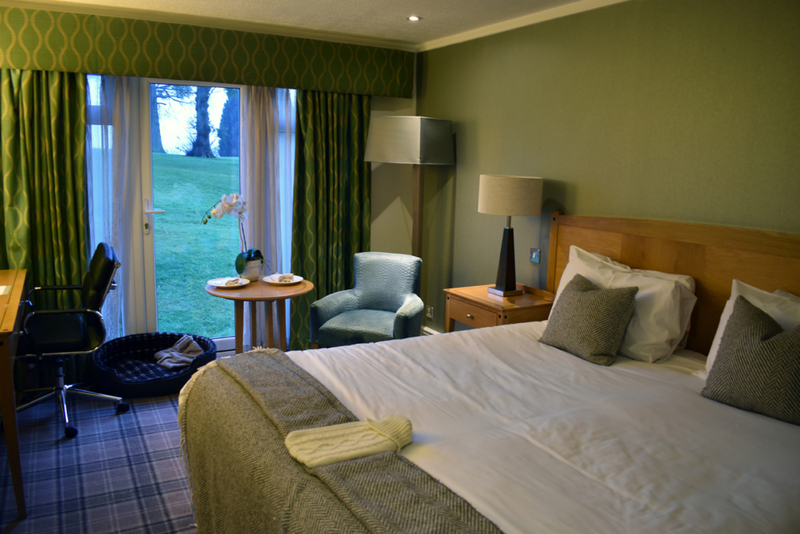 Rooms in the dog-friendly wing are comfortably furnished in a contemporary, country house style – tartan carpets, memory foam beds (one for you and a memory-foam doggy bed for Fido). Ours had plenty of closet and drawer space, two comfortable chairs, a table and a dressing table with enough power points for all my chargers and devices. Plus, as you can see below, a well dressed hot water bottle in case of chilly nights. The hotel sits on what seems to be the highest hill in Tewkesbury, with views of rolling countryside in all directions. It’s surrounded by an 18-hole golf course which is “Highly Recommended” by Golfshake and gets good marks from UKGolfGuide and Leading Courses. Great for golfers but less so for travelers with pets. 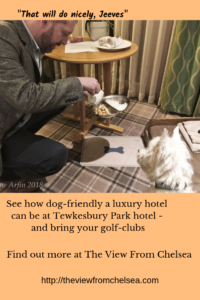 The dog-friendly rooms are all on the ground floor with French doors onto the golf course (which are unusable, as you can exit but not re-enter through them). As soon as we arrived, Lulu found the doors to the grassy lawns madly exciting. And the golfers, who pass frequently in close proximity to the hotel, found Lulu – her nose pressed against the glass – entertaining as well. So much for rooms with views, privacy or morning daylight. The curtains had to remain firmly shut through our entire stay. 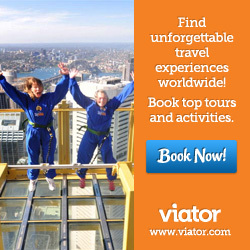 the staff are universally helpful and welcoming. the hotel’s peaceful spa has a reasonably-sized, heated pool, steam room, sauna and outdoor hot tub (a bit of a challenge to get into on a wintry evening though) as well as a gym. A variety of treatments are available too. the breakfast buffet is generous and varied (but leave Fido in your room because the buffet is laid out in a separate room, down a corridor and a short flight of steps, from the piano lounge where dogs are allowed. It makes for a bit of a juggling act and someone has to stay behind with your pooch). if you opt for a dinner bed and breakfast package, Fido gets a special meal, cooked to order in the hotel kitchen. 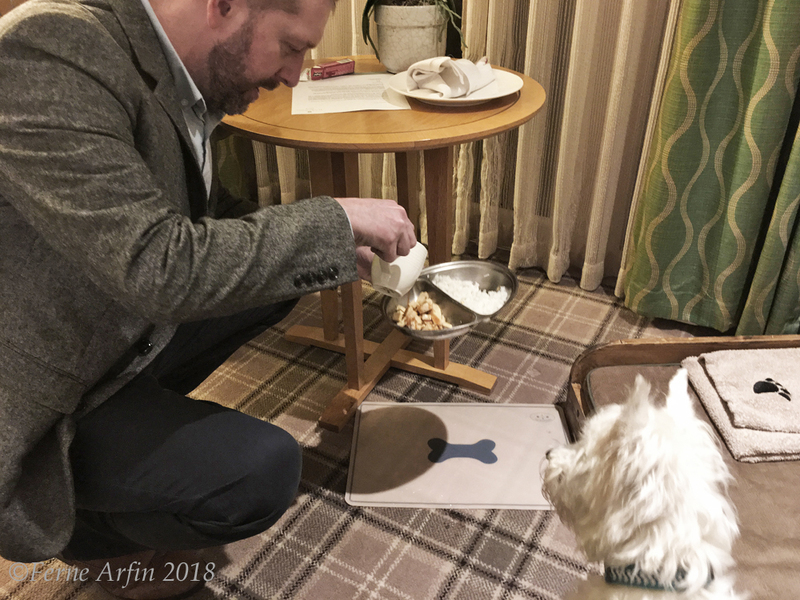 Party manners – Lulu is attentive and on best behaviour as food and beverage manager Leon puts the finishing touches to her room service meal of chicken, rice and gravy. The Canine Retreat package costs £199 for two plus one pampered pooch and includes a welcome pack of doggy treats with suggested walks, bed and breakfast accommodation, a traditional afternoon tea, a £25 spa voucher and a three-course dinner for two as well as a dog’s dinner. Lulu enjoyed her generous chicken, rice and gravy supper. As is common in the travel industry, we were guests of the hotel. The Tewkesbury Park Hotel has a competent restaurant with a menu based as much as possible on locally sourced ingredients as well as a varied, reasonably priced and well-chosen wine list. Quite a few wines – including champagnes – are available by the glass and the selection of moderately priced bottles is very good. Most of Europe is represented on the list as well as a few New World wines from South America and South Africa. But my oh my what gorgeous desserts. Go if only to finish your meal by sampling the genius pudding efforts of Chef de Patisserie Dinesh. White chocolate and passionfruit panacotta with blood orange sorbet, gels, meringues, nuts and bits of greenery. Divine. 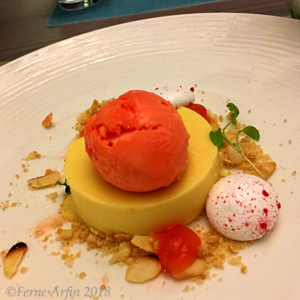 A white chocolate and passion fruit panacotta, topped with tangy blood orange sorbet, was wobbly and sweet yet interestingly astringent. A companion’s dark chocolate and praline mousse looked both light and rich – how is that possible? He reported that the balance of flavours worked very well. The restaurant at Tewksbury Park is fully licenced, so you don’t have to be a hotel guest to dine there. Elsewhere in the town, pickings are pretty slim though we have heard good things about My Great Grandfathers and The Abbot’s Table. 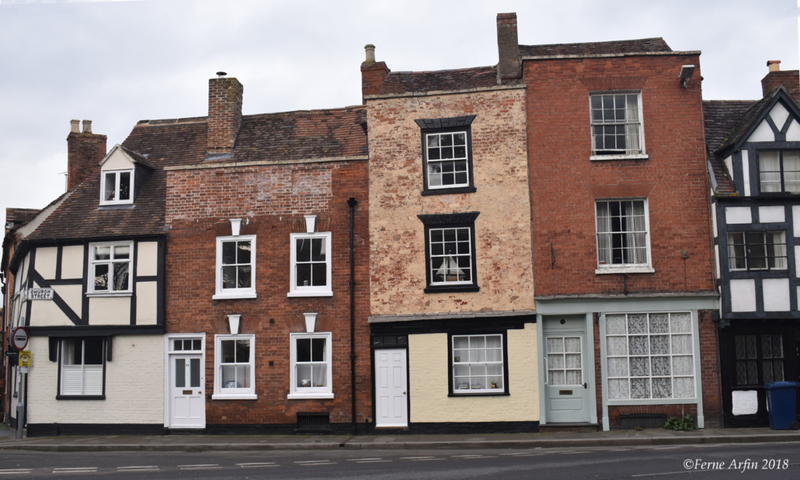 We don’t know if Tewkesbury is trying to attract dog lovers but there certainly seemed to be a lot of “dogs welcome” signs on the doors of coffee shops, cafes and pubs around the town. 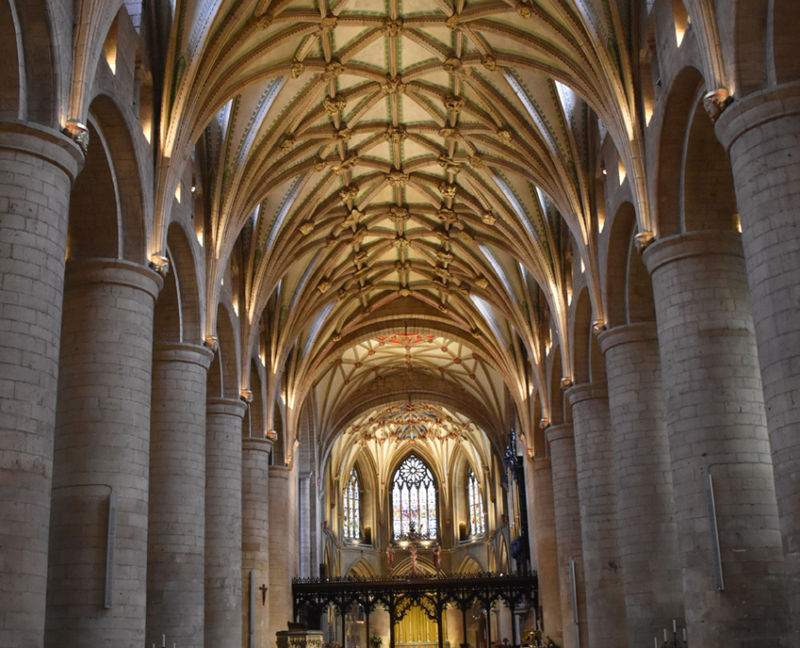 Visit Tewkesbury Abbey – More than 900 years old and a Benedictine Abbey before the Dissolution of the Monasteries under Henry VIII, the Abbey Church was saved from total destruction when the townspeople bought it from the King for the price of the lead in its roof. 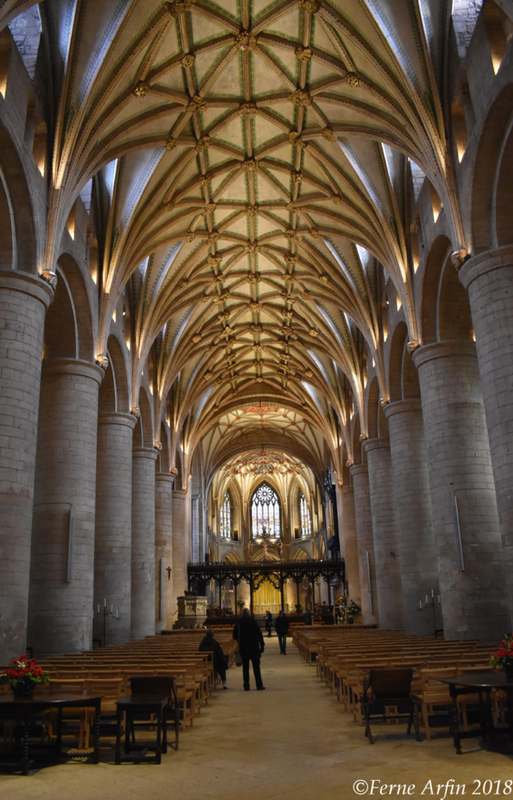 It’s now a monumental parish church with seven impressive medieval stained glass windows and, at 14 metres square and 45 metres high, the largest Norman church tower in existence, anywhere. 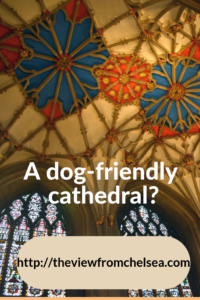 Remarkably, it is completely dog-friendly. Your well-behaved pet is even welcome during services and concerts. 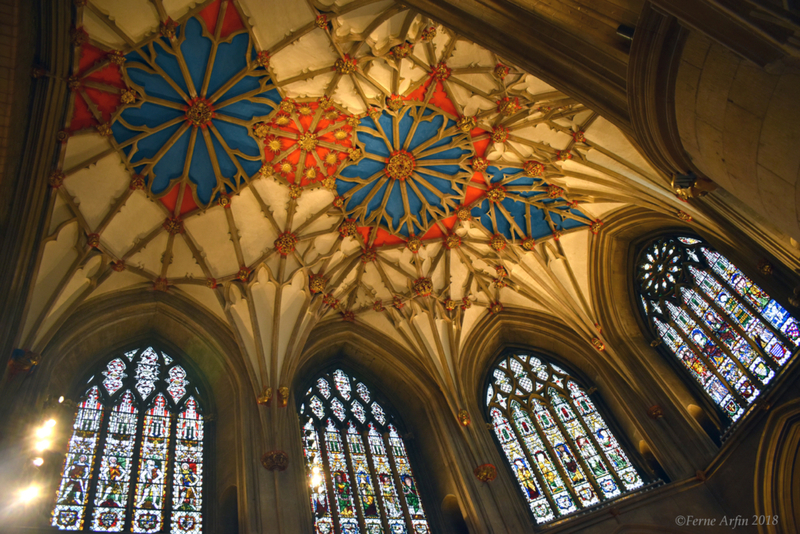 Explore this ancient market town. 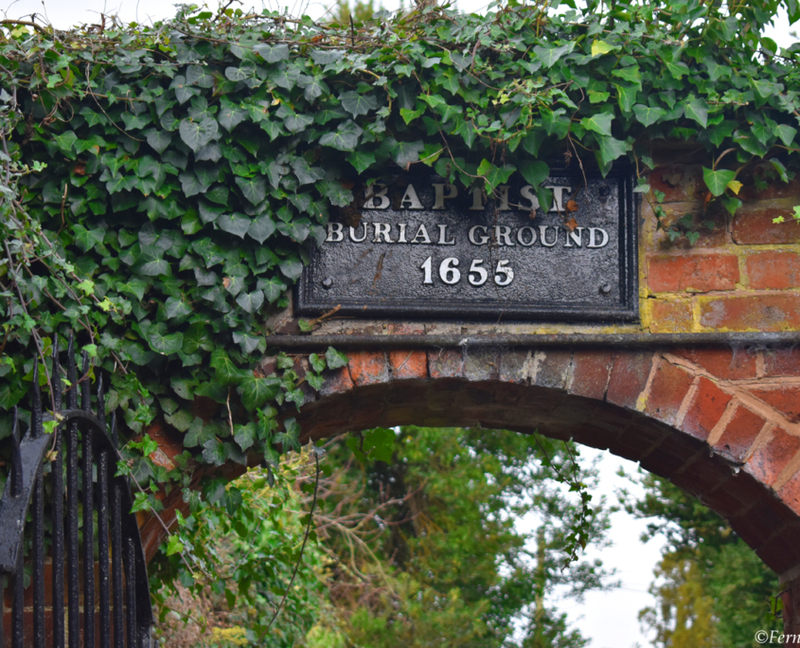 It has 379 listed historic buildings, a photo op around every corner. 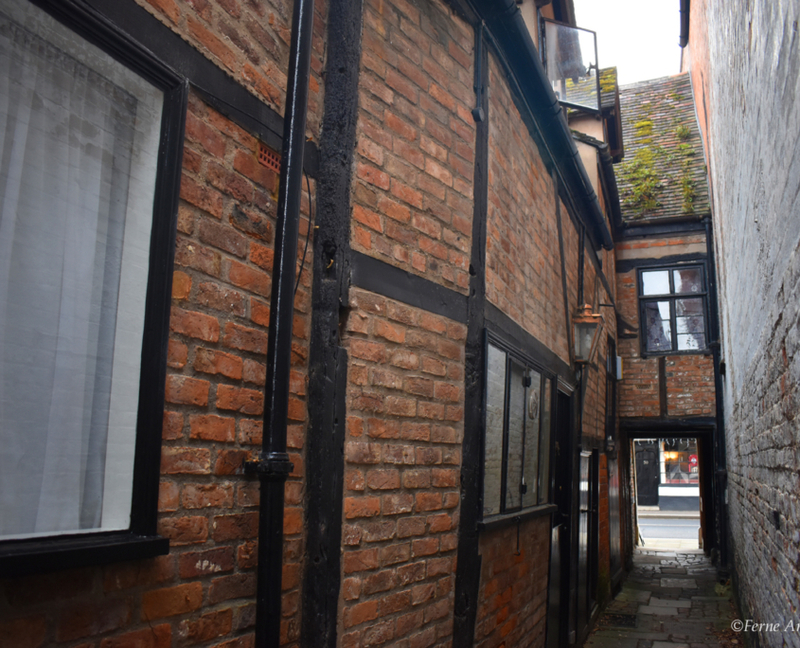 There are at least 30 interesting alleyways worth a look including Old Baptist Chapel Court, leading to the 17th century Old Baptist Burial Ground and Meeting House. Enjoy the rivers. The upper reaches of the Severn and the River Avon come together here. There are peaceful, dog-friendly walks along the mighty Severn, Britain’s longest river, and boat trips on the Avon with views of medieval cottages and an ancient mill. Severn Leisure Cruises offer ferry services and half hour pleasure cruises around the town and between Tewkesbury and Twyning from April to September. 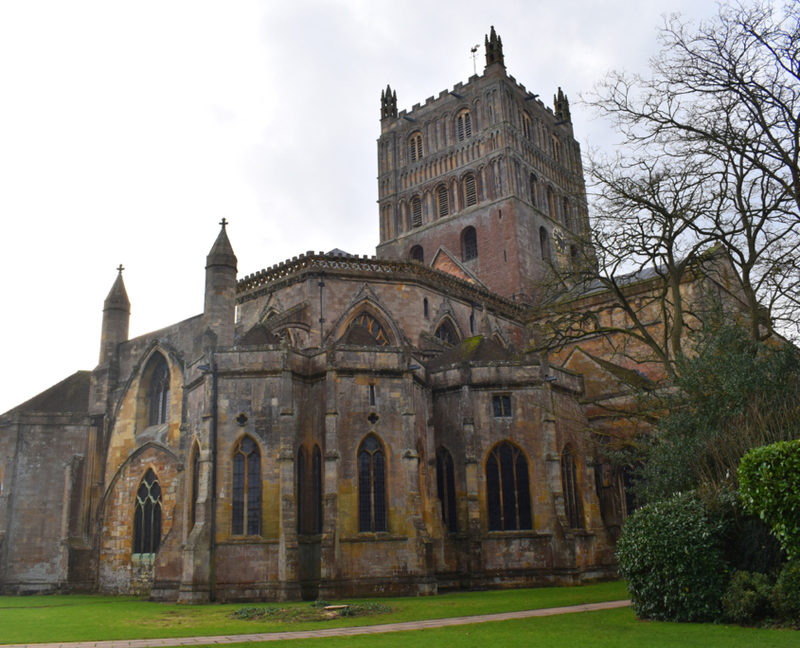 Follow the Battle of Tewkesbury Trail – The Battle of Tewkesbury in May 1471 was a turning point in the Wars of the Roses, putting the House of York in power for the next 14 years. Much of the battlefield remains undeveloped rolling meadow and woodland, perfect for dog walking leavened with a bit of history. 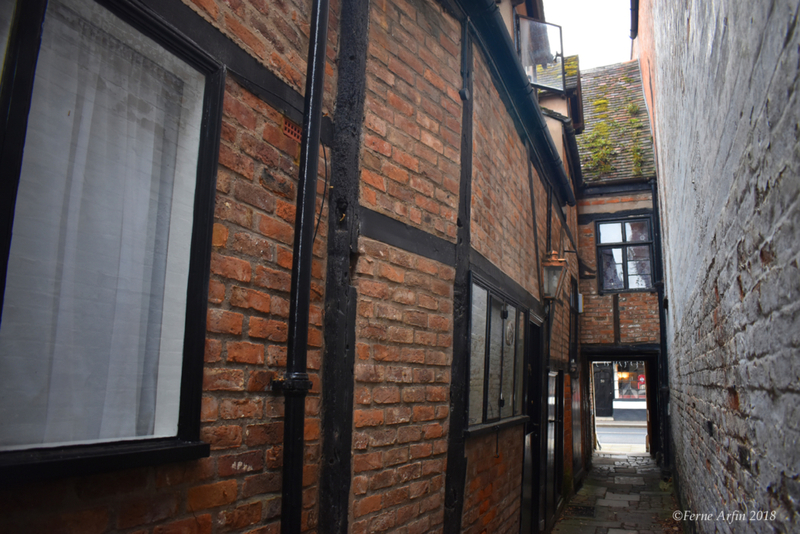 Pick up a map leaflet in the Tourist Information Centre on Church Street, near the Abbey, and head out. 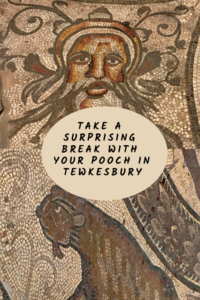 See what other travelers think and book Tewkesbury Park for your next dog-friendly break. 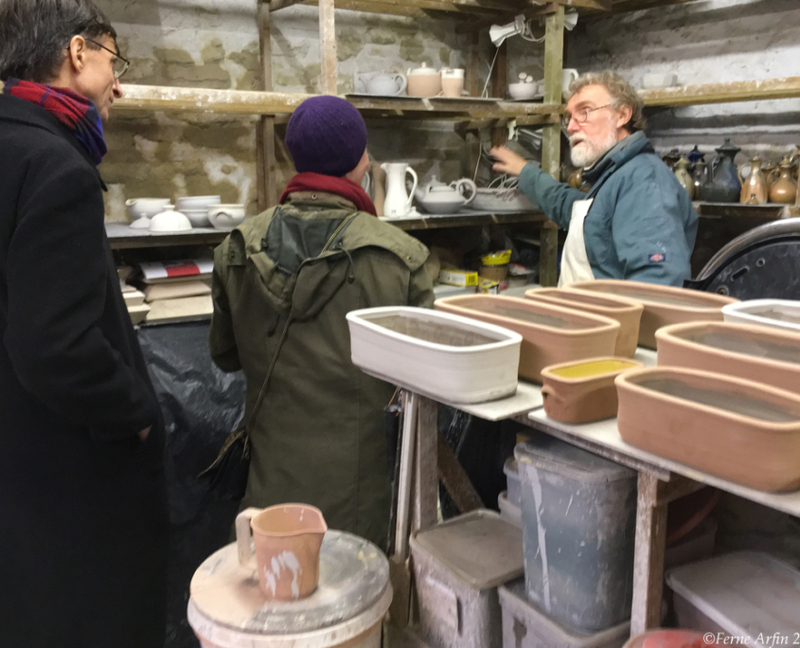 Potter Toff Milway explains his working methods to visitors at his Conderton studio, near Tewkesbury. Shop for beautiful and original salt-glazed pots, jugs, platters and planters at ceramic artist Toff Milway’s studio in Conderton, about 6.5 miles on the B4080 from Tewkesbury. Milway is friendly and generous with his time. 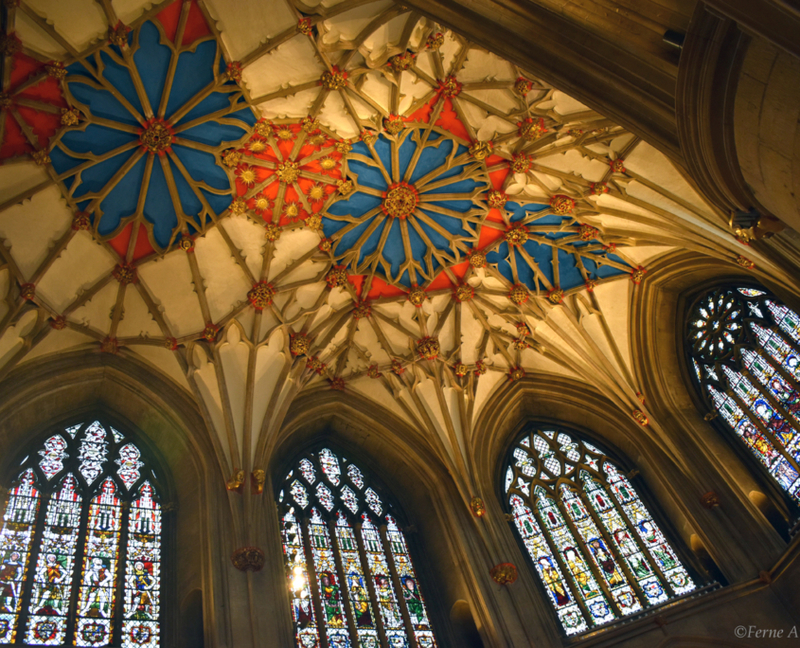 If you are genuinely interested he will take the time to explain the mysteries of salt-glazing and how the subtle colours, gentle iridescence and interesting textures of his work are achieved. The Old Forge, Conderton Near Tewkesbury, Gloucestershire GL20 7PP. 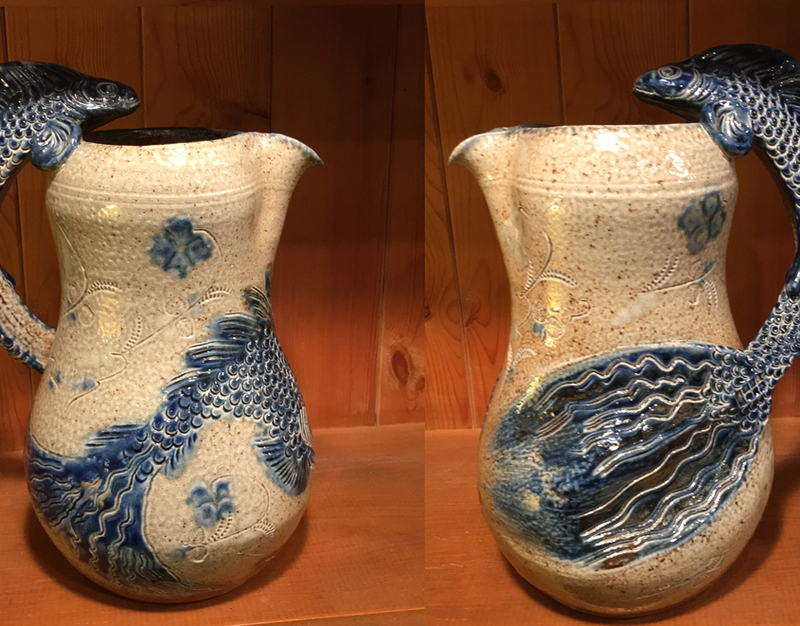 Both sides of a salt-glazed jug with fish handle, by Toff Milway of Conderton Pottery. Ceramic artwork shown with permission of the artist. After Londinium, Corinium, was the second largest city in Roman Britain. 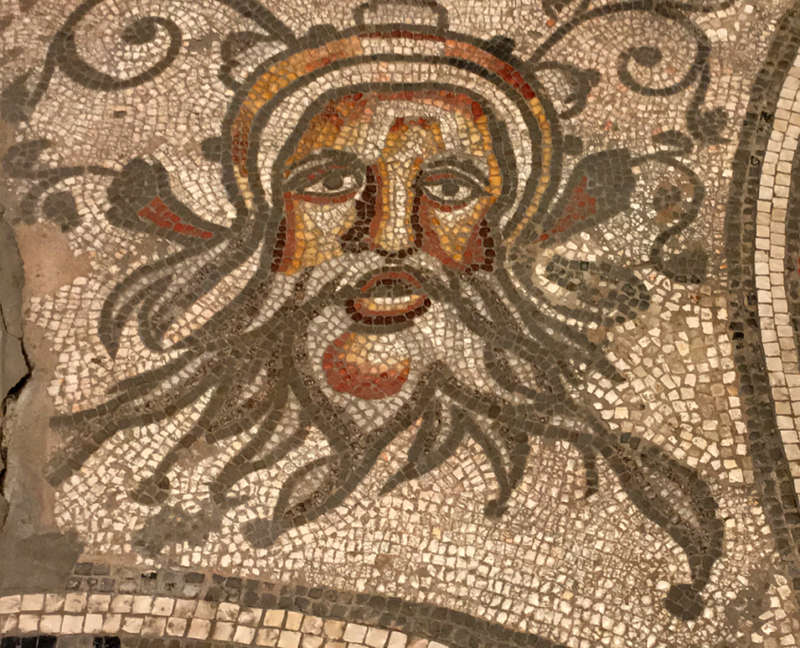 Today it’s known as Cirencester and it’s a 40 minute drive from Tewkesbury but well worth the effort to see the national collection of Romano-British mosaics at the Corinium Museum. Above and below, details of mosaic floors at Corinium Roman Museum in Cirencester. 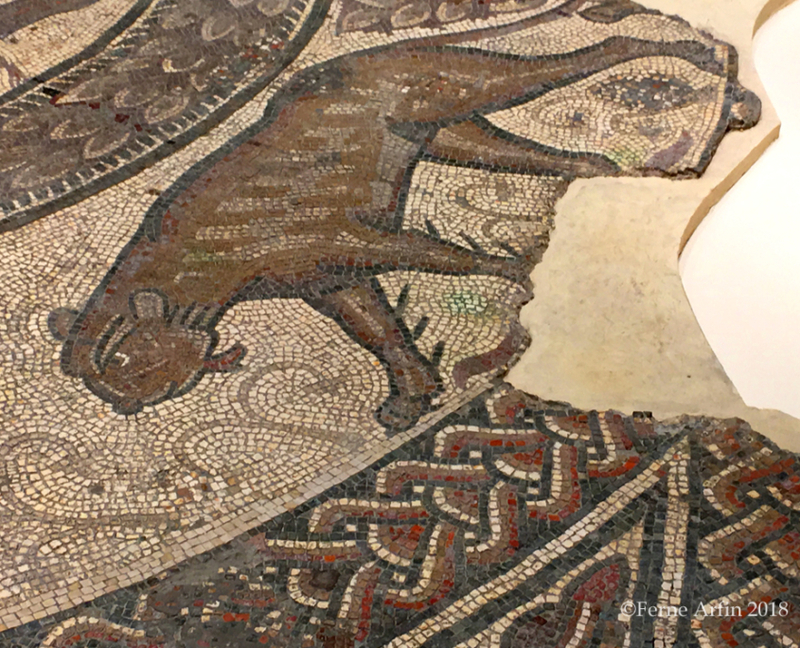 The mosaic floors, most discovered in Cirencester but some brought from other Roman sites, offer a fascinating glimpse into the lives of first and second century Romans in Britannia. There’s a small admission charge to the Corinium Museum which, unfortunately, is not dog-friendly. 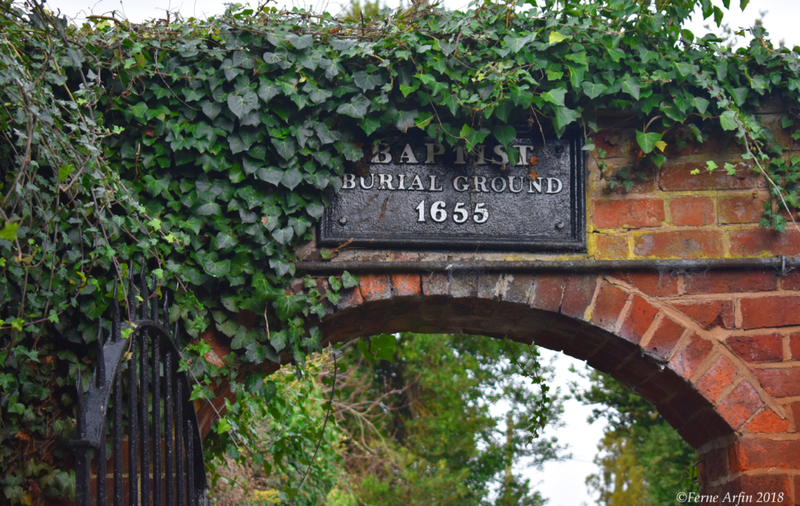 But medieval Church of St. John the Baptist, nearby, is. 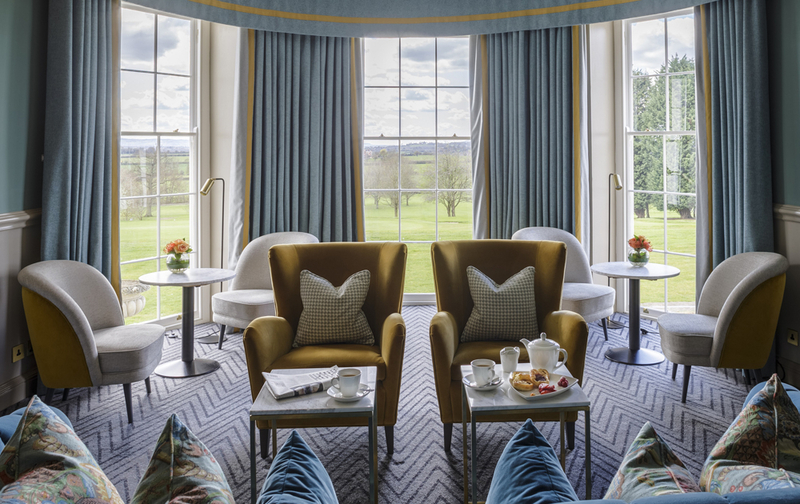 If you get the munchies, stop off along the way in the spa and racing town of Cheltenham, where local girl turned world traveller, Emma, of The Gap Life Diaries, recommends a handful of tempting, relaxed, all day eateries. The 900 year old church, built in the English Perpendicular Gothic style, is all that remains of a former Augustinian monastery (yes, Henry VIII at it again). Cirencester’s ancient street plan includes twisting passages and alleys lined with independent shops. 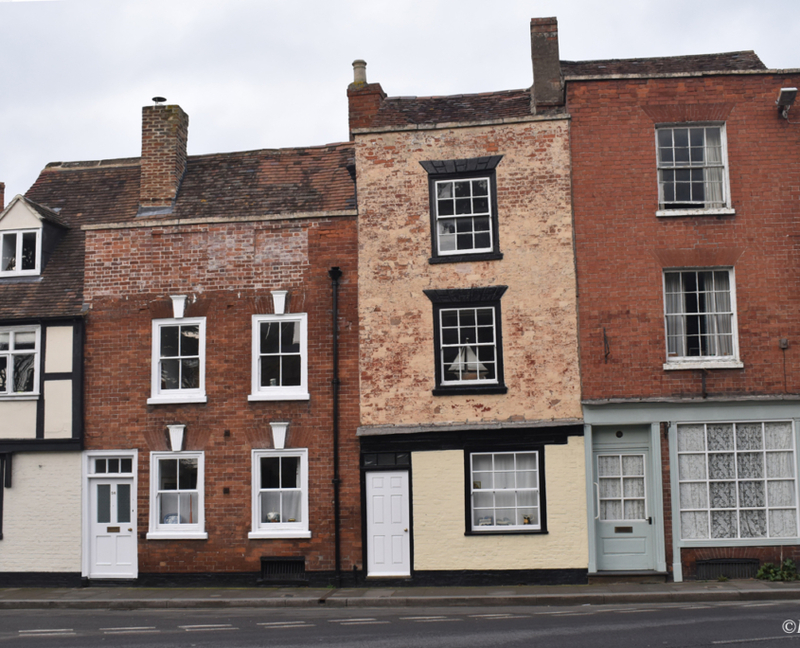 In one of them, The Stableyard on Black Jack Street, we stopped for coffee at Jesse’s, an interesting looking dog-friendly bistro that we later found out has two AA rosettes and is listed in The Good Food Guide, Hardens and the 2016 Michelin Guide. So a return visit is probably in the cards.